Shoot. I had high hopes for this cereal. New Berry Fruitful from Kashi is made up of bite-size wheat biscuits that are filled with with a combination of raspberry, strawberry, apple and grape. The filling has a nice fruity taste with raspberry being the most prevalent presence. Unfortunately, that same tasty filling is strangely chewy and its flavor gets lost in milk. The outer wheat biscuit is just wheat. It tastes wholesome and healthy. When eaten dry, the combination of flavors is fine. It's almost desirable that there's a boring part of the cereal to help make the fruit filling seem more exciting. But when milk is added, the flavors get muted and the texture differential between the softening wheat and chewy fruit becomes distracting. I was brought up enjoying cereals in the Kellogg's Frosted Mini Wheats family, so it's no surprise that I might miss the added sweetness of a thin layer of frosting. I know Kashi cereals are supposed to be more healthy, but a bit of sweetness in the outer layer would have helped this cereal. Let's face facts: This is a cereal people buy because they think they're trading in sugar for whole grains and dietary fiber. Peanut Butter Toast Crunch has the same amount of sugar per serving and only 4 grams less dietary fiber. If you're parading around as a super healthy cereal, either be actually super healthy or taste good enough to make us forget that you're being a little sneaky. 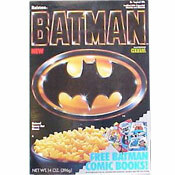 I'd like to see this cereal slightly reformulated. They need to soften the filling and add a hint of flavor or sweetness to the wheat. Maybe a year from now, we'll see a box of Berry Fruitful that says "Improved Taste & Texture". Until that dream day happens, I can't really recommend this cereal. Shoot. Nutritional Considerations: Each 29 biscuit serving of Berry Fruitful has 170 calories, 0.5 grams total fat (0 saturated and 0 trans), 0 mg cholesterol, 0 mg sodium, 42 grams total carbs, 6 grams dietary fiber, 8 grams sugar and 6 grams protein. What do you think of Berry Fruitful? I like this cereal a lot and if you think the sugar content is high, look at other cereals. This is a great product for healthy living and eating. It's the perfect cereal. I discovered it on the shelf while searching for a healthy breakfast cereal amidst dozens of sugar packed unfit to eat products. The berry fruitful allows the natural ingredients to provide the pleasant taste. 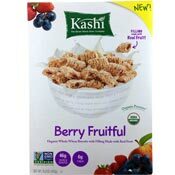 I've been eating this and other Kashi products for over two years exclusively and cannot get tired of them. Thumbs up, Kashi! I like the wholesome wheat taste against the chewy fruitiness, especially when soaked in milk. I think the taste/texture combination is a lot more interesting than Kellogg's equivalent. Also I don't mind the sugar. It's not like it's a lot more than any other cereal. I do eat it because there's no preservatives, which is hard to find in a good cereal. Use almond milk and this is great cereal. I think you are completely wrong. This cereal actually tastes better than the Kellogg's equivalent, and I've switched completely to this one. A plus is that it actually uses real fruit, while the Kellogg's one is mostly palm oil and sugar.